Drilling companies often buy fee simple estates or sever mineral estates to drill for oil. The law regulating oil and gas ownership in the U.S. generally differs significantly from laws in Europe because oil and gas on shore are often owned privately in the U.S. as opposed to being owned by the government in many European countries. In the U.S., extraction of oil and gas is generally regulated by the individual states through statutes and common law. Federal and constitutional law apply, too, such as the doctrine of correlative rights. Oil and gas rights offshore are owned by either the state or federal government and leased to oil companies for development. The tidelands controversy involve the limits of state ownership. Although oil and gas laws vary by state, the laws regarding ownership prior to, at, and after extraction are nearly universal. An owner of real estate also owns the minerals underneath the surface, unless the minerals are severed under a previous deed or an agreement. Whoever owns the fee of the soil owns everything below the surface, limited by the extent of the surface rights. Del Monte Mining & Milling Co. v. Last Chance Mining & Milling Co. A landowner may permissibly extract oil and gas from beneath the land of another, if the extraction is lawfully conducted on his own property. Kelly v. Ohio Oil Co.. A landowner, however, may not drill at an angle to reach oil deposits under property not owned by him. Such rule gives land owners an incentive to pump out oil as quickly as possible to capture the oil of their neighhors. As has been found out, such indiscreet practice depletes gas pressure to force oil out of the ground. The government agencies such as the Texas Railroad Commission therefore regulate extraction by individual owners. Refined hydrocarbons that escape into the ground are not subject to the law of capture, unless evidence shows that the refiner abandoned them. Champlin Exploration, Inc. v. Western Bridge & Steel Col, Inc. Extracted oil and gas which are subsequently stored in underground reservoirs are considered as personal property, rather than as an interest in real estate. Texas American Energy Corporation v. Citizens Fidelity Bank & Trust Company. Drilling companies do not always own the land they seek to drill on. Generally, the companies own the mineral rights, mineral estate, on a property owned by another party. Lessees of mineral rights have a right of reasonable access to leased land to explore, develop, and transport minerals. Hunt Oil Co. v. Kerbaugh. In an “unless-delay rental” lease, a lessee agrees to pay delay rentals so long as the lessee is not drilling on the property. An “unless” oil and gas lease terminates automatically, if the lessee fails to drill within the specified time or pay the delay rentals as called for in the lease. Schwartemnerger v. Hunt Trust Estate. To commence drilling a well under the habendum clause means that substantial preparations for such drilling has to be undertaken, as long as such measures have been commenced in good faith and with due diligence. Breaux v. Apache Oil Corp. The habendum clause sets out these terms, as well as most significantly, identifying the parties to the transaction and their interests in the conveyed real property. An oil and gas lease generally includes a force majeure clause. Such agreement relieves the lessee from liability for breach, if the party’s performance is impeded as the result of a natural cause that could not have been anticipated or prevented. The Act of God must completely prevent performance and must be unanticipated. Courts often construe this clause very strictly and rarely enforce it. For example, a tornado preventing performance in Oklahoma would not trigger the force majeure clause, since tornadoes are a common occurrence in Oklahoma. The Responsible Federal Oil and Gas Lease Act, also called the “Use It or Lose It” bill (HR 6251 IH), proposes prohibit the Secretary of the Interior from issuing new federal oil and gas leases to holders of existing leases who do not diligently develop the lands subject to such existing leases or relinquish such leases . Oil and gas contracts have nuances which differ from standard contracts. For example, when an assignment of an oil and gas lease expressly provides that any extension or renewal of the lease is subject to an overriding royalty, a new lease that is substantially similar to the first lease and procured by the assignee during the term of the first lease, is regarded, as a matter of law, as an extension of renewal of the first lease. Reynolds-Rexwinkle Oil, Inc. v. Petex, Inc. Statutes can override agreements made by parties. For instance, a statute may void an agreement to indemnify a construction worker as to liability for death or bodily injury incurred on an oil well, regardless of the indemnitee’s negligence, without affecting the validity of an insurance contract. It affirms the right of an individual party to obtain insurance, not to protect the interests of the indemnitee. Amoco Production Co. v. Action Well Service, Inc. These suits for negligence are typically brought by drilling site workers known as roustabouts. Law school classes teaching oil and gas law generally require that students first take a class in property and contract law. In Texas and Wyoming, oil and gas law is tested on the bar exam. Oil and gas law practitioners usually fall into three broad categories. First, oil and gas companies usually have in-house attorneys that advise the company of its rights and the legal issues. These attorneys are usually assisted by landmen, who examine property titles land oil and gas rights and acquire property for the company. Landmen may be lawyers themselves. Second, practitioners may represent private parties. When an oil company attempts to obtain land from a private party, a party may retain counsel to be better informed of his or her rights and to negotiate a favorable bargain with the oil company. Last, oil and gas attorneys work for federal and state governments that oversee energy and environmental policy and land acquisitions. Charles Harper went to Business School at Loyola University in New Orleans, Louisiana. During that time, he worked full-time in the Oil & Gas Industry in Louisiana and Texas for over 5 years to pay for school. Mr. Harper worked directly with many different offshore and land-based oil & gas exploration, drilling, production refining and service companies and all related oil & gas operations. Mr. Harper also assisted in the formation and operations of a Rock Springs, Wyoming based oilfield service company called Rocky Mountain Laydown Service, Inc., where large Mack diesel trucks were built especially for RMLS by a company in Wicket (Midland-Odessa ) Texas, and then they were transported from Texas to Wyoming where they would provide drill pipe services to land-based oil & gas drilling rigs in the Utah, Colorado and Wyoming oilfields. 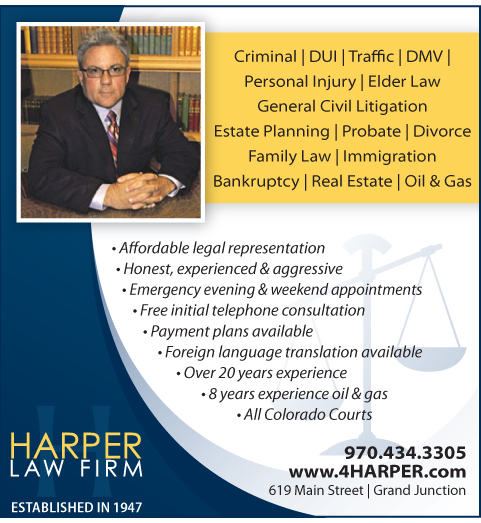 Mr. Harper also worked full-time in the Admiralty Section at a large New Orleans based law firm for 3 years, where he gained additional work experience with Admiralty and Maritime Law which was also directly related to the Oil & Gas Industry.